You made it. Another round of planning, prepping and praying for the biggest Sunday of the year under your belt. Congratulations! We had an incredible day at Southbridge Fellowship with our highest attendance ever and saw more people accept Christ than at any other service in our history. 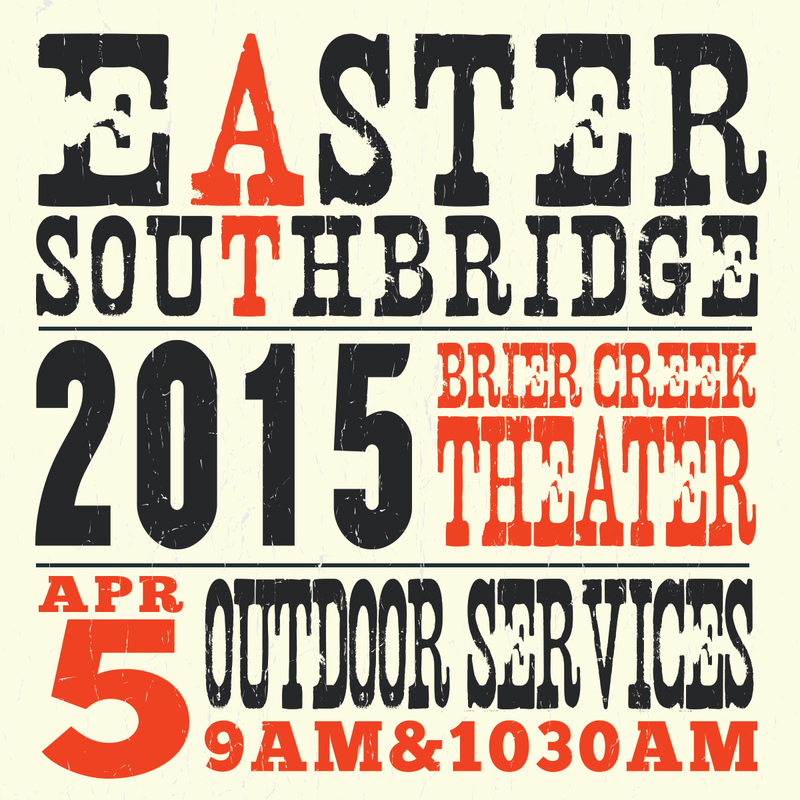 The Service – This was the second year of outdoor Easter services. We currently meet in a movie theater and use the adjacent parking lot to bring in a stage and chairs to host the outdoor services. One benefit to this approach is the amount of people who find out about our church simply by driving or walking by. My favorite story was from two young women who were originally on their way to Target saw the gathering and decided to attend. One of them made the decision to trust Christ during the service! How awesome is that?! Design – We drew inspiration from vintage Billy Graham era posters and hatch print design. The outdoor service and gospel focus reminded us of revival days so we took the concept and ran with it. Web banners, social media graphics and print pieces were created from this design. Promotion – Our promotions focused on visual and easy to share social media content and personal invitations. We shared videos and graphics on our social networks leading up to Easter. Our social media efforts were a combination of organic and promoted posts. We spent about $50 and reached thousands of people. We handed out invite cards multiple weeks before Easter with an announcement from our Lead Pastor about the importance of personal invitations. We produced a silly video with the help of our Children and Youth Pastors to give tips about how to (and how not to) use invite cards. 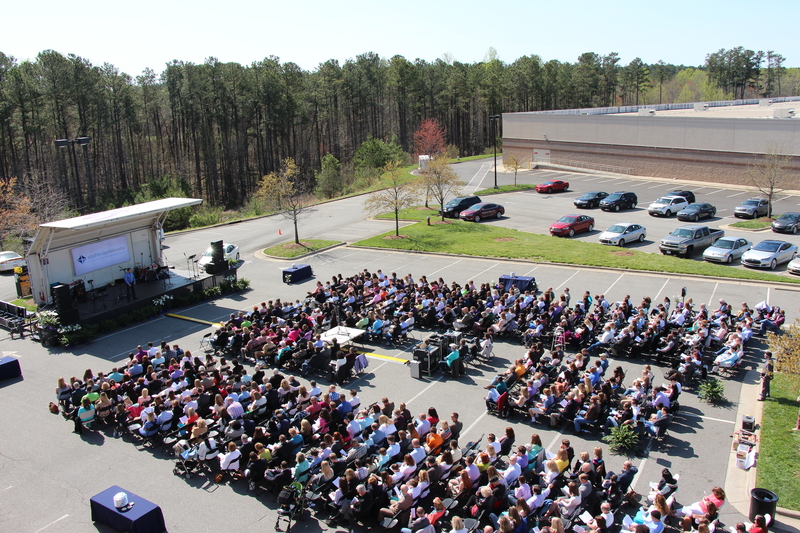 Results – Over 1,100 people attended and many people accepted Christ as their Savior! Easter can be an exhausting day when you work at a church. Take some time this weekend to rest, recharge and reflect on God’s work …and then get ready ’cause Sunday’s coming! How did your church celebrate Easter this year? I live in Raleigh, North Carolina. This really happened in Raleigh in February 2014. This is a road that I drive every single day to go to work. That means that I’ve seen schools close for even the possibility of snow. And by snow, I mean flurries. Just look at what happens when it actually does snow in Raleigh. It’s important to communicate with your church and keep everyone updated when there’s inclement weather. 1. Post it on your website. Create a web page that’s the first thing people will see if they visit your website. It’s a key place to keep people informed about any potential cancellations to services or events. Include “updated on” with a time stamp too so people know if the information is current. 2. Change your answering message. Believe it or not, people do still use the telephone. Make sure to update your church’s answering message if you’re going to be out of the office for a few days. Let people know you’re currently closed and when you plan to reopen. Also, include an alternative way they can get in touch such as an email address. 3. Share through social media. Social media is a great way to keep people up-to-date in real-time. If there’s bad weather coming, people look to social media for traffic reports and news updates so it’s a perfect place to share how your church services and activities are being affected by the weather. What do you think? What are other ways to communicate during bad weather?